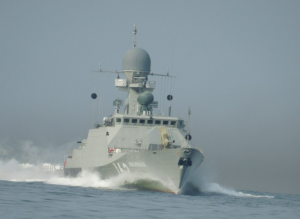 Makhachkala (hull number 163) is a Project 21630 Buyan 'river-sea' class corvette designed for reinforcement of Caspian Flotilla in littoral sea and river zone. Corvette Makhachkala is the third and the last Project 21630 Buyan ship built by the Almaz Shipbuilding Firm for Russian Navy. The ship was laid down in March 2006 and launched in April 2012. After a certain delay in delivery of the 100-mm gun mount, corvette Makhachkala finished state trials in October 2012. Acceptance certificate was signed at the Almaz Shipbuilding Firm on December 4, 2012. The Flag of Russian Navy was hoisted at the ship on March 2, 2013.